LED luminaires for street lighting have the benefit of precision, allowing them to be programmed to minimize light pollution, increase visibility, and maximize efficiency by directing light to the exact desired area. Proper technique in the design of street lighting is crucial for a safe and efficient nighttime visual environment in any setting. The quality of lighting is vital for the safety of motorists on the road as well as pedestrians on sidewalks or crosswalks. Well-lit paths can instill a sense of security in pedestrians and allow them to feel more comfortable exploring the nightlife in an area or even just walking home. Welsh and Farrington (2008) found that improved street lighting decreased crimes by 21% compared with an area where street lighting was left in its existing condition, sporting old and or broken lamps. Another report by SWOV found a relatively large portion of night-time accidents occur on unlit sections of roadways. Thus, ensuring that the spacing of the street lights do not allow for unlit sections, the frequency of night-time accidents should decrease. 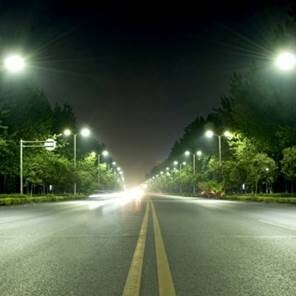 To ensure consistent illumination of streets and roadways, factors such as street width, pole height, and illumination levels should be taken into account. Equations are available to determine the appropriate amount of space needed between each pole. The Department of Transportation (DOT) has defined typical pole spacing for standard roadway lighting as well as highmast lighting. Coordination with street elements such as tree canopies and utility equipment should be performed as well. Lighting simulation programs as well as photometric modeling can be used to take all of these variables into account and output a design of light spacing that creates a uniform and efficient street. Photometric modeling is the use of a model to show where lights will be placed and the layout of the light spread onto the street and or sidewalk. It can also be used to help facilitate the selection process of appropriate LED fixtures. Models of the existing luminaries are developed as baselines for the proposed luminaire models to be compared to. These models are based on real world parameters and are made up of calculation points that show the light level reading (foot candles) at that specific point, as well as isolines to help identify the distribution patterns and levels of light intensity. An example of this model can be seen below as a before and after of a street lighting upgrade to LEDs. The “after” model represents a more uniform light and well-lit street. This can be seen by the slight overlap of light in between the far left fixtures. Installing lower wattage and longer lasting LED street lights reduces energy and maintenance costs by 60-75%. 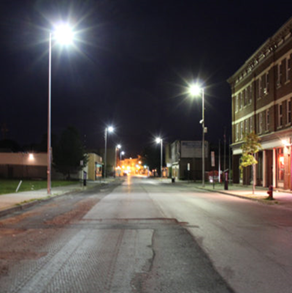 Wendel’s professional, in-house staff will perform a no cost/no pressure Preliminary Assessment of the potential for savings with your community’s street lighting. These same professionals can then design and implement a street lighting upgrade with 100% cost transparency. Within the last decade, LED technology has significantly improved allowing production costs to be reduced while the efficiency and performance characteristics continue to increase exponentially. Due to these continually progressing improvements, LED technology has become the lighting option of choice for roadway and exterior area lighting. Another major advancement in LED technology is the extensive lifespan of modern systems. LED fixtures’ useful life spans differ from traditional street lighting fixtures in that traditionally HID lamp and ballasts are used. The lumen output of HID decreases rapidly over time until they fail or “Burn-out”. In contrast, LED systems lumen output diminishes gradually over time, and are often defined with an L70 rating of >100,000 hours. These ratings define the usable light levels of a fixture as a percentage of its original output. For instance, a lamp with an L70 rating of >100,000 hours will be producing 70% of the light out output that it was producing new once in service for 100,000 hours. This high rating allows for more accurate budgeting for when the fixtures will need to be replaced in order to maintain desired light levels. The useful lifespan for HID lamps is on average 5 years with ballasts needing to be replaced approximately every 10 years. Most modern LED fixtures available today have useful lifespans exceeding 25+ years for normal dusk-to-dawn operation. 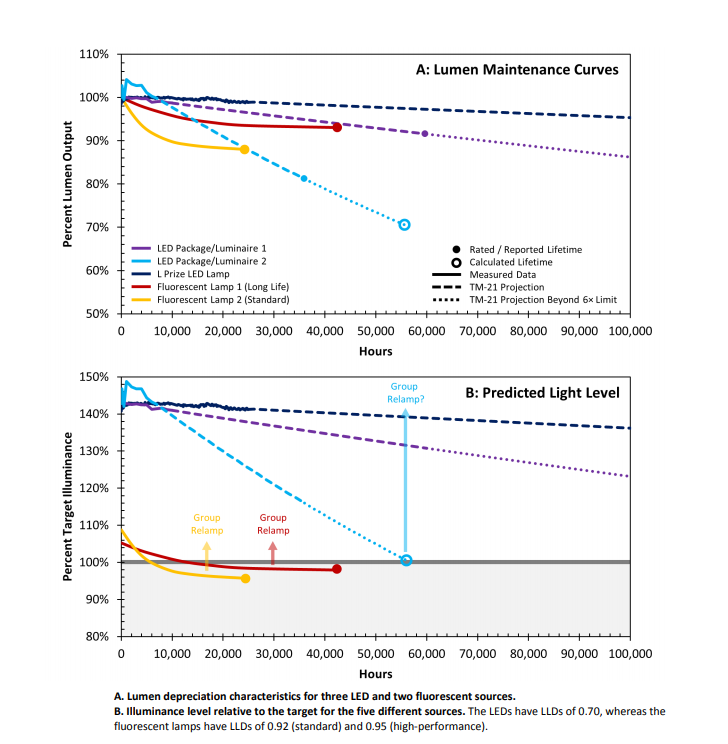 The following chart illustrates the lumen maintenance curves for the various technologies. The many advancements of LED technology over the last decade has resulted in a viable energy efficient replacement option. Well-designed LED luminaires have high fixture efficacies, optimized color rendering, directional optics, and extensive useful lifespans. These factors allow for the replacement of existing fixtures with LED systems that utilize substantially lower wattages, all while meeting or exceeding the same light levels. Correlated Color Temperature (CCT) is the description of a light’s color in terms of its warmth or coolness. Represented by Kelvin, a CCT of below 3,000K will have a warm white appearance similar to that of an incandescent. As this value increases the light will become brighter and cooler. There is an ongoing discussion in the street lighting community concerning what an appropriate CCT is for street lighting, as LED’s with various options for CCT and Color Rendering Indexes (CRI) have come into the picture. There are many factors that come into play in this discussion and affect what CCT is chosen for a particular street lighting project. The international Dark-Sky Association (IDA), an organization focused on the control of light pollution, published a paper outlining the potential hazards of blue-rich white light sources. These blue-rich lights represent LEDs with high CCTs. The study found that increased blue light emissions increased the likelihood of glare and interference of the ability of the eye to adapt to low light levels. These emissions have also been known to interfere with the human endocrine system, leading to a reduction in the production of melatonin, a hormone shown to suppress breast cancer growth and development. IDA sought to avoid these effects by creating an FSA (Fixture Seal of Approval) requiring lighting with a CCT of 3,000K or lower. Poor lighting caused by low CCT can also make it difficult for motorists to see hazards or objects clearly at night, creating an unsafe driving environment. Utilizing LED luminaires with higher color temperatures, such as 4000K, improves safety conditions when properly designed for the application. The higher or whiter the color temperature, the greater the perception of brightness is to the human eye. This allows for an increased ability to perceive colors, definition, and movement of other drivers, pedestrians, and objects all in a comparatively low light setting. It has also been shown that white light doubles a driver’s peripheral vision and reduces their braking times by 25% when compared to high pressure sodium lights (HPS) which have a low CCT. Locations that could benefit from this approach include areas where security is a concern, or high pedestrian conflict areas, such as intersections and downtown districts with a lot of nightlife. Circadian rhythm is the internal clock that controls your sleep/wake cycle. It’s what causes you to feel tired at night and alert during the day. Outside factors such as light and darkness impact this cycle, which is why we get more tired as it gets darker and vice versa. When LED’s emerged as a viable and efficient light source, concerns arose that the white lights would cause circadian and sleep disturbances. Philips lighting, a global leader in LED lighting solutions, have stated that if properly designed and applied, there should be no impact on sleep behavior. This proper application and design involves choosing the right optics and light intensity for the area of application, specifically CCT. In the first few years of LED outdoor lighting use, lights with higher CCTs were more available, efficient, and cheaper than those of lower CCTs. Efficiency losses occurred when creating warmer CCTs and thus production of these warmer lights was low. With advances in LED technology, warmer CCTs could be made without losing as much efficiency. Even with these advances, however, a higher-CCT LED is more efficacious than that of a lower CCT, keeping all other properties equal. This efficiency translates to lower utility costs and greater environmental benefits. Choosing the right CCT can affect not only the safety of an area, but the aesthetic appearance as well. 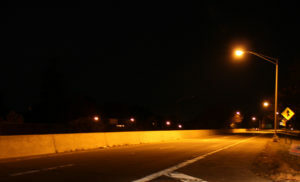 Street lights with too low of a CCT will appear orange in color and cause a scene to look dreary or dark. 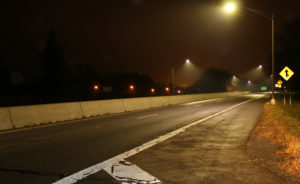 Studies have consistently shown that this orange light makes streets look darker than a white-lit street, even with identical levels of luminance. Below is the difference between a street with lights of low CCT’s compared to the same street after having the lights replaced with LED’s with higher CCT’s.